Face your fear. It’s not always that easy I know. Easier said than done but I have learned that there is no other way. You must hold fear’s hand. A few years ago I went Ziplining in the only underground cave in the world, in Louisville Kentucky. It’s dark, you’re a 100 feet underground, you get given a light on your helmet. Now, my light, I got the dud one. Somehow these things seem to happen to me, so mine started to flicker, and about half way through the zip lines it was barely able to be seen just a few feet in front of me. We’re in the darkness, and it’s cool, and damp, and eerily quiet. We’re on about the fourth zip line, and they got faster, and longer, and wider, as we went along. This particular one was a little bit different. We had to cross a roped off drawbridge, with wooden slats in the dark, to get across to where we were going to jump off the zip line. I felt like I was in Indiana Jones. As I stand holding the rope, the bridge starts to sway. I’m trying not to look down, but I have to see, where the wooden slat is, or I’m going to fall into the depths of the cave. The fear was still with me, and I said, “Breathe, you’ve got this. Sometimes you got to go into a bit of self-talk in those moments. “Breathe, you’ve got this. Breateh you’ve got this.” You just have to keep putting one foot in front of the other. Half way across, they sent the second person along behind me, and the bridge swayed twice as much. I wanted to throw up, I wanted to get across, and just started walking a little bit faster. When we got to the edge, we barely had 30 seconds, no time to think about it. They zipped me up, they hooked me on, and whoosh through the air across this incredible cavern, lit up beneath me. I was in awe, and I would have missed that if I had allowed fear to dictate what I did. I would have missed that if I’d allowed fear to dictate what I did, the day that I stood on that TEDx stage. I could have retreated, I could have said, I’m not ready, but I knew in my heart that this was something I needed to do and one thing, I’ve been in a lot of situations, where I’m afraid and one thing I’ve learnt is, it’s always worth it when you get to the other side. Everything we hoped for, our freedom, our authenticity, fearlessness, all the things that matter, are on the other side of that fear. Out of our comfort zone, somewhere where we can stretch ourself. 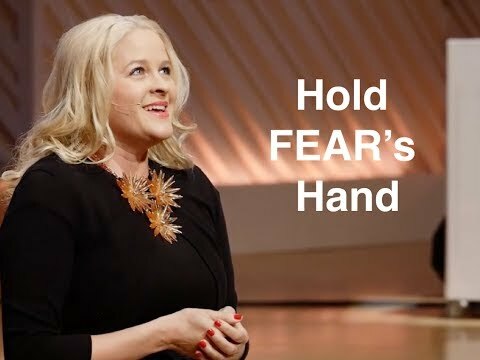 You may also like to check out this video where Kirsty talks about overcoming fear and about where FEAR might be robbing you or holding you back. To learn more about Kirsty click here. To read more on her speaking topics click here.